Stir together tomato paste, water, black pepper, rosemary, basil, garlic powder, and if desired, cardamom. Coat both sides of steak with tomato paste mixture. Grill steak on an uncovered grill directly over medium coals for 6 minutes. Turn steak; grill for 8 to 12 minutes more or until desired doneness. Cut into serving-size pieces. Garnish with fresh rosemary and serve with grilled sweet peppers, if desired. 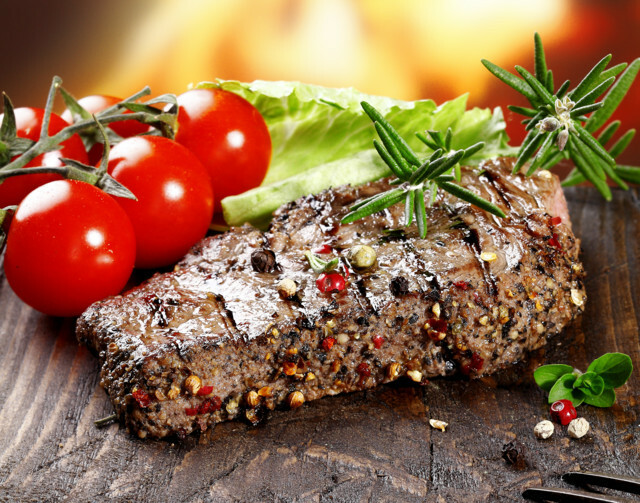 To grill by indirect heat: Arrange preheated coals around a drip pan in a covered grill. Test for medium heat above pan. Place steak on grill over drip pan. Cover and grill for 20 to 24 minutes or until desired doneness, turning steak once.